What is your tank's cost per litre? Tanks vary greatly in relation to cost per litre of water storage and we have provided an analysis of this to help you to understand how this works and why. We have also provided a comparison to Poly tanks and an explanation of why steel tanks are a better option. As you can see in the graph, steel water tanks become more economical as they get larger. Steel water tanks, with an average cost per litre of 7c (Perth WA), have a significantly lower cost per litre than many Poly tanks, which can be over 50c/litre for some of the smaller sized tanks. How does this compare to the cost/l for Poly Tanks? 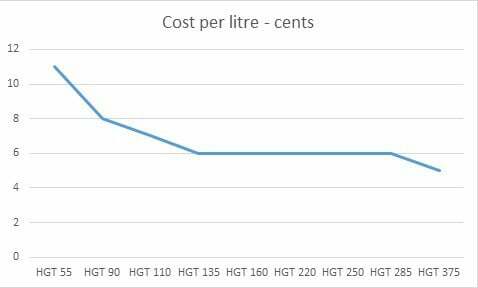 However, the price per litre for these tanks does an about turn and rather than continue downwards as might be expected, costs rise as the tanks increase in size. Around 60% of Poly tank production is between 22,500 to 24,500l with the demand above this size predominately turns to steel lined tanks. Aside from the superior strength and longevity, this in part can be explained by the logistics of transporting tanks. In most states, tanks in excess of 24,500 litres are considered to be over size loads, which are subject to various restrictions. These restrictions increase the costs of delivery and this increased cost needs to be recovered through higher pricing. Why have two Poly Tanks when you can have one Steel water tank? Steel tanks are stronger and last longer. Heritage Water Tanks have a 20-year conditional warranty, whereas many Poly tanks may only have 10 year warranties. Steel water tanks are more resilient in fire prone areas. Ease and lower cost of transportation. Heritage Water Tanks are delivered to site in a convenient and easy to transport flat pack. Less complicated plumbing arrangement and less fittings to maintain. Heritage Water Tanks offer the option to catch additional rainwater from the tank roof catchment area via their unique gutter system which can collect up to 25% of the tanks volume each year (in a 500mm rainfall zone).